It's 2005 and I'm attending an afternoon game with a bunch of friends from work. We've done this a few times, so by now I know the Hormel Row of Fame Song is going to illicit some boisterous karaoke. Sometime around the fourth inning, it starts. Are you in Hormel's Row of Fame? Except that this time the track gets stuck. "That WOULD be a lucky seat." is Ron Gardenhire. He's in love with Punto. Casilla would be picked up by another team in an instant. If you want to take a chance on waiving someone do it with Punto. No one is going pick him and his salary up. Tolbert is a hustler, but he is a hack. Send HIM down. Q: Who played second base the most last year? Q: What did he hit? A: .202/.280/.259. In 228 at-bats. Q: How was his defense? A: His UZR at 2B was -9.6. His UZR/150 was -20.9. To start the season he played second base in 22 of the first 27 games (being replaced in five games by Harris, not Punto). On May 2, hitting .160, he was benched and Tolbert was given a shot. Because Tolbert also struggled, Casilla was given another week or so at the end of May. He went 6-29. Was handed the job again for eleven straight games at the end of August. He hit like crazy the first five of them and then got one hit over the last six games. To get on Gardy for not giving Casilla enough leash is nuts. He gave him enough leash to hang himself, and almost enough leash to hang the rest of the team. Just so it's clear: I like Casilla. I think he's a good player who just needs to turn a corner. But make no mistake: he has already received far more time than he's deserved. And the person who kept giving him that time was Gardy. I am so glad I'm not the only person who remembers the day the recording skipped. A guy sitting with my group of friends said, "Those marketing people think of EVERYTHING. That'll get butts in the seats!" I'm sure many people we tell think we made it up, but indeed, the recording skipped! I haven't laughed that loud in ages... thanks for sharing! I'm convinced. Punto's problem is not Gardy. Interesting theory though about getting Punto through waivers. I'm not sure, but I wouldn't be surprised at all if someone claimed him. He's a darn good utility man. He's being paid starter money, but only marginal starter money. Butts, weiners...Hor-day. Talk about beating a dead dog. 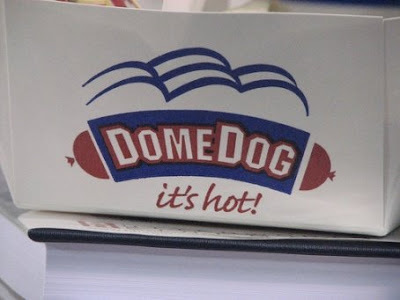 You can't call a dome dog a dome dog in an outdoor stadium. Probably have to find a weinie that ties into THAT Target Mutt -- a more sickly stuffed runt that I ever saw walking the floor at TwinsFest. Punto on waivers? Well, if the Twins have to pay him $4 mil, why not keep him. Chances are he would pass waivers and then another team would just have to pay him $400,000+ and the Twins the rest. Go figure. Alexi has to show a lot this spring...that he MIGHT be capable of becoming the second baseman of the future. He won't stay here as an arbitration eligible utility guy, that's fer sure. That was 2005? I can't believe that was 2005. Nick (Sully) and I sing "You'll win a Hor..." "You'll win a Hor..." "You'll win a Hor..." ALL THE TIME. This means we are coming up on the 5th Anniversary of Hor Day. It is a Wednesday. Twins are in Texas. We need a plan.